4 April, 2012” — There are moments, encounters, conversations that make sense of this enterprise known as PEN. And not just sense, but joy. 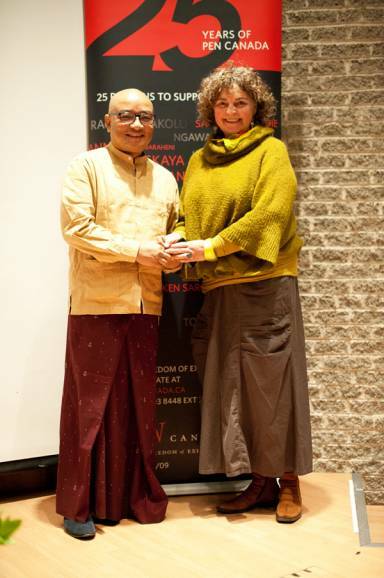 Last month, I had one of those moments, on a frigidly windy, bright day in Toronto, when I met Zarganar, the Burmese poet, comedian, activist, who has been on the WiPC case list since the late 1980s, through at least three prison terms of varying length and severity. After his release last fall in a general amnesty (although he’s very uncomfortable about the fact that several hundred other prisoners were not released), Zarganar immediately got his very first passport, at age of 51, and began to campaign in Burma and abroad for the by-elections of April 1st, when Aung San Suu Kyi was elected, along with at least forty other members of her NDL party. Zarganar saw the amnesty, the subsequent shift in international thinking about the longstanding sanctions, the election itself (fair or rigged, or both) and Aung San Suu Kyi’s potential, then, new authority as an MP, as a test, for everyone—not only the Myanmar military, who still hold 25% of the seats and enormous power, and for President Thein Sein, but also for activists for democracy like himself. “It’s showtime,” he said, with a grin. Here’s a brief report on Zarganar in Toronto and a chat I had with him on video. 1. Middle East/North Africa: In November, I went to Bahrain as part of an IFEX mission. In January, our joint report was released, simultaneously at events in Tunis and London. We’ll be doing follow-up, with centres and hopefully in Geneva, when Bahrain is subjected to the Universal Periodic Review process at UNHRC in May. The situation in Bahrain continues to be very serious and underreported; one of our main cases, Abdullah Al Khawaja, is in the ninth week of a hunger strike, and demonstrations are escalating. Ghias al-Jundi has rejoined PEN, working on WiPC MENA issues, and Centre Development issues (Tunisian PEN), and also for IFEX, facilitating the Tunisia anthology. Freedom to read challenges at the Jaipur Literary Festival led to a statement from PEN International, after consultation with All India PEN Centre. Increasing controversy surrounding the Eurovison Song Contest in Azerbaijan is something on which we’ll be formulating a media response. Sara has recruited two interns to support Europe work—Katriina Lapijuurii, a Russian speaker, and Alev Yaman to work on Turkey. 4. Americas: In late January, I took part in the very successful PEN international mission toMexico, with representatives from five PEN centres and the PEN International executive. The statement of solidarity signed by 170 distinguished international writers, in support of our Mexican colleagues, our meetings with high-level officials, diplomats and Mexican human rights activists, and the stellar event organized by PEN Mexico all added up to an impressive, effective mission. We learned on March 13th that the crucial legislation making crimes against journalists a federal crime was finally passed by the Senate; it is still to be ratified by the States. We’re currently working on an ongoing strategy for Mexico. The astonishing fines of 40 million dollars against El Universo newspaper in Ecuador and another 1 million against the authors of a book on corruption led to a series of RAN alerts which were picked up extensively across the Americas. The fines have been withdrawn but we remain concerned that problematic legislation still exists. Cathal Sheerin engaged 7 Latin American PEN Centre presidents in a letter of protest to the Ecuadorean government. 5. Africa: Cathal’s interview with a Kenyan journalist who witnessed killings and was subsequently penalised generated much interest in the media and social media. We briefed John Ralston Saul on free expression concerns in Africa in advance of his visits to PEN members Senegal, Ethiopia and Djibouti and where he had the opportunity to raise cases with the African Union. 6. Women’s Day, March 8th: we focussed on three imprisoned women – two in Turkey, and a Syrian poet –and also women journalists murdered in Mexico in 2011. 7. United Nations: This week, I’ve sent a letter to all Centres asking them to lobby their own governments in the weeks running up to the May UPR where we will be following up on submissions on Bahrain, Ecuador, South Africa, and Tunisia. Deji Olokutun a Ford Fellow with American PEN, is working with us on our UN and UPR projects. We’re submitting a statement with other organizations on Sri Lanka; PEN’s input will be on linguistic rights. 8. Other matters: With Hori Takeaki and a small committee, I’ve been working on the draft of the PEN International Declaration on Digital Rights. This will be finalized and sent to centres in June for consideration before presentation, and I hope, acceptance, of a Declaration, at Congress. With other committee chairs and centre representatives, Sara and I’ve been working on improving the submission process, content and use of Congress Resolutions. Watch for new guidelines concerning resolutions: we’re strongly recommending succinct, focused resolutions intended for a broader audience than officials and bureaucrats. (PEN resolutions: Pithy, Eloquent, Newsworthy.) And very shortly, I’ll have news for you of plans for the Writers in Prison Committee Conference in 2013. This is the ninth Chair’s Notebook I’ve written since becoming Chair of the WiPC in November, 2009, at the Congress in Linz. I’ll write once again before Congress in Korea, when this seemingly very brief three-year term comes to an end; I’ll try then for an overview of these three years from my perspective as WiPC Chair. A number of people have written recently to ask if I will stand for a second term; I’d be honoured to do so. And to serve again.